For those of us who grew up in church since Sunday School, the answer may seem easy enough: "It's obvious you go to Heaven!" But, for a new Christian like Simon here, Satan sadly has done a diabolical job of causing mass confusion concerning what the Bible says about our eternal destiny. Let's debunk some common misconceptions about what life is like for the Redeemed after death. Purgatory — A Catholic teaching, Purgatory is a stopping off point on the way to Heaven where Christians must suffer for awhile to purge ourselves of sin before God will finally let us in. Not true, for 1 John 1:17 tells us that, "The blood of Jesus, His Son, purifies us from sin." It's Jesus who cleanses us, and not us burning off our sins. Soul Sleep — This popular misconception claims that when you die you go into the ground and there your soul remains unconscious until you are resurrected. Also not true, for 2 Corinthians 5:8 tells us, "To be away from the body and at home with the Lord." We will never be unconscious after death. Become an Angel — Popularized by cartoons, this misconception says that when you die you become an angel with wings and a halo. But, no, Hebrews 1:14 tells us, "Are not all angels ministering spirits sent to serve those who will inherit salvation." And, look at 1 Corinthians 6:3, "Do you not know that we will judge angels?" Angels are a totally separate creature than humanity, and we don't become them. Ethereal Existence — This misconception sadly teaches that we'll end up in a spiritual world sitting on clouds playing harps all day long. How boring! This is clearly one of the most effective Early Church heresies Satan has used to warp our idea of Heaven by making it mind-numbingly dull. Fortunately, the idea that Heaven is a place where spirits float around on clouds is just not found in the Bible. So, there are a lot of misconceptions about Heaven and how we get there that are meant to confuse people and curb our enthusiasm. This is what the Bible teaches concerning where the saved go when they die. Immediately upon death, your spirit is ushered by angels into the presence of Jesus in Heaven (Lk. 16:22; 23:43). You are then given a physical, recognizable "intermediate body." It's a real body (Lk. 16:19-31). You are not a ghost, for God alone is spirit (Jn. 4:24). When the day of the Rapture comes, for both the living and dead believers, our bodies will be transformed and resurrected into our glorified, eternal bodies to dwell with Christ forever (1 Cor. 15:51-58; 1 Thes. 4:13-18). When the Church returns with Jesus at the Second Coming at the end of the Tribulation to set up His 1000-year kingdom, we will also be living on the earth, reigning with Jesus as teachers and administrators and lawmen over the people who are still living in their earthly bodies (Dan. 7:13-14,18,27; Rev. 20:1-6). Finally, after the Millennial Kingdom is over and on into eternity, Heaven as the New Jerusalem will come down to a revitalized New Earth, and there we will dwell literally in Heaven on Earth (Rev. 21). Oh, if I only had the space to tell you about the wonders of the New Jerusalem! Please read Revelation 21-22, as well as go to our website at lamblion.com and search "Heaven", to read up on those who are saved's exciting destination. And that is only a glimpse into the marvels that await the Redeemed, for as 1 Corinthians 2:9 reveals, "No eye has seen, no ear has heard, and no mind has imagined what God has prepared for those who love him." I put Simon's question to one of our lamblion.us blog polls and got the most interesting response. An atheist, ever poking into Christian websites looking to argue against God's existence, found the poll and got thousands of his Reddit.com Atheist group friends to vote "Cease to Exist." That's the misconception that lies that there's just nothing after this life and once we die we're annihilated. It's an empty hope for the unsaved, who do not wish to go where they truly know they're destined, which is Hell. Contrary to what they're claiming, Jesus explained in Luke 16 and Revelation 20 and other verses that there really is an afterlife to be concerned about. The eternal destination of all people, be it Heaven or Hell, and what eternal life will be like is why it is so important that we live with an eternal perspective. Life right now on this earth is just too short. What we do with our lives today only makes sense when we're looking at the bigger picture of eternity. Since we could die even in the very next minute, we must know where we're going after we die. That's why it's so important to live with an eternal perspective, for then everything else in life will make sense. I took several statistics courses. When you get an outlier like that you normally throw it out, which should be done here. Sorry Nathan, but you are incorrect. The chosen sleep upon death until the resurrection. The bible makes it clear to those to whom this has been revealed. We are mortal. We become immortal and present with the Lord at our resurrection, not at our death. Sleep is not death. Read what Christ Himself said about Jarius' daughter: "she is not dead, but asleep"! In 2 Cor 5:8, Paul was referring to his resurrection, not his death. Nobody goes to heaven or hell when they die. They sleep and await their resurrections - some to life and most to death. PLEASE repent of what you've learned from men, including all mythology, and study with the Holy Spirit. He will reveal the Truth about this to you. 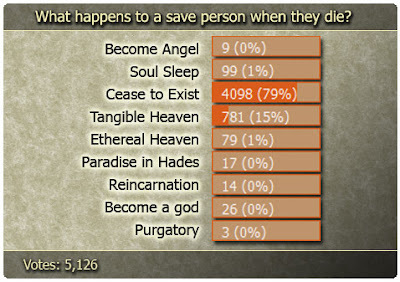 Craigo, for a detailed response on the fallacy of soul sleep, check out What Happens When You Die? Congratulations on your poll being attacked so strongly by the atheists: just praise the Lord you're doing something right! I did believe soul sleep once. But if you think about it, even under the soul sleep belief you still go to Heaven instantly. When you go to sleep you aren't aware of it. You just wake up again and there you are. Well, it would be the same with soul sleep. You die, then you wake up in Heaven, whether 1 minute or 1,000 years passed. The thing that turned my away from soul sleep was the story of the rich man and the poor man that Jesus told where the rich man wanted the poor man, his servant, to still tend to him. Well, they had died before the return of Jesus or judgement day yet they were awake, not asleep in the grave. "The thing that turned my away from soul sleep was the story of the rich man and the poor man that Jesus told where the rich man wanted the poor man, his servant, to still tend to him. Well, they had died before the return of Jesus or judgement day yet they were awake, not asleep in the grave." Yes, the mind of God is amazing. Over a lifetime of studying the Bible, deep into the nuances of parables and some statements of our Lord Jesus, one finds an utter unity, perfection, of accurate, detailed illustration in such as the "pearl of great price" and everywhere in the Bible, to the point of proof, after deep study, these things came from a supernatural mind. One can only conclude the Lord never threw idle, inaccurate comparisons out there which would confuse, that He would illustrate death which is "soul sleep" as He did in the story of Lazarus, this not, in the least, His way, God not the author of confusion, of contradictions. It's almost, or actually is, to accuse the Lord of false doctrine in the story of Lazarus and the rich man, if soul sleep were true, to portray a plain picture of consciousness after death, therefore, even misleading. This is not, is never, the way our God of absolute truth teaches us, rather the error of man in his understanding of scripture. Error is usually a case of building entire, contradictory doctrines out of one or a few scriptures, lifted out of context or dispensation, that SEEM to contradict. Perhaps my brain is not functioning properly today. Are you saying soul sleep is or is not accurate in your understanding? I find it amazing that for those who are so certain that there is no God that they spend so much of their lives obssessed with the argument. You'd think they'd feel completely free just to move on. My following thought could provide an answer to my speculations. Perhaps it is existance of Christians must be a threat to them. Perhaps WE are the object of their obssession. I think this is true. If so, the atheists will be celebrating our removal from the Earth after the Rapture. Chrisitans and God will be out of their lives once and for all. The older I get the more tendency there is for my thoughts to get lost somewhere between my brain and my fingers tapping on the keyboard. That is...not being typed accurately. aka PROOFREAD DUMMY! I believe to be abscent from the body and present with the Lord. The thing I just heard on a Crosstalk podcast was that Dr. Reagan believes that unbelievers are not subject to an eternal hell, rather annhialated!? Isn't that unscriptural? Dr. Reagan's article and arguments for and against the Conditionalist View of Hell are posted in this article and beginning with this interview. Ana, Paul's not saying that Christ's sacrifice was insufficient for salvation (Rom. 3:21-26; Heb. 10:10-14), but of the believer's privilege to serve and suffer for Christ. Jesus alone provides salvation (1 Pet. 1:11; 5:1; Heb. 2:9). In other words, as believers in Christ we can actually find joy when we suffer for Christ and in the spread of the Gospel.